I love ponchos. They’re an ideal accompaniment to any outfit and I just think they’re simply the perfect piece of clothing. There was one autumn / winter, around 2006, when I lived in a poncho. I purchased the said poncho for about $15 at a very unsexy shop (it might have been Target) and I wore it every. single. day, and didn’t take it off until spring. It was a perfect wrap to wear over whatever I was wearing that day to keep me warm and comfy at the office, but perhaps the main reason for my poncho obsession is that it covers my problem areas like my arms and stomach beautifully, without having to hide behind an oversize and often unflattering sweater. I actually didn’t intend to knit a poncho when I first casted this project onto the knitting needles. I was going to make yet another lacy scarf but realized that I was over scarves. I wanted something different and decided to stitch the two sides together and make a poncho instead! So here it is – my first project of the new year! This pattern was inspired by Debbie Bliss’ Lacy Scarf. I doubled the number of stitches to make the piece wider and turned it into a poncho by sewing two sides together. A pair of size 6 (US) knitting needles. I used Addi Turbo circular needle in size 6. I love Addi because it really helps speed up my knitting! 3 skeins of yanrs, at 50 grams each. 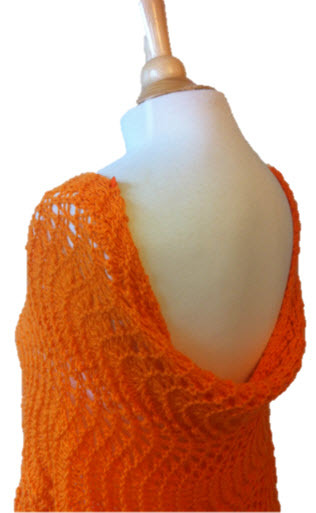 I used Cascade 200 Sport in Orange Sherbet (7825) that I purchased from WEBS yarns. I would say that the level of difficulty for this project is “easy,” but if you’re not sure of any of these techniques below, I recommend you checking out Youtube for wonderful tutorials. I’m a self-taught knitter, and I could have never done it without the tutelage of amazing online teachers! Using size 6 (US) needles, cast on 76 stitches. Row 3: * Knit (1 time), [k2tog] (3 times), [yo, k] (6 times), [k2tog] (6 times), [yo, k] (6 times), [k2tog] (3 times), knit (1 time). Repeat from * one time. Repeat these 4 rows until it measures about 45 inches (three skeins of yarns). Bind off. Note: If you want a smaller poncho that doesn’t fall off your shoulders, simply make it shorter. Try it on as you knit, so you can make a desired length / size. Also note that the garment stretches significantly when you block so it’s important to take that into consideration. One more thing — bind off very loosely; otherwise, it becomes hell when you try to mattress stitch a very tight piece. Block the piece, if using wool yarns. Note: I recommend that you don’t skip this step. Blocking your finished project is not my favorite part of the process, but it makes all the difference in the finished product, especially in lace knitting. Blocking will help define the intricacy of the lace and makes the piece look more sophisticated and professional. Using the tapestry needle, mattress stitch the pieces as shown on right. I’m so in love with this poncho. I can see myself wearing it all the time, both inside the house and when going out. I’ve always liked orange and I especially love this hue. I like how the yarn drapes nicely on the back too! I hope you give this pattern a try, and let me know how it turns out! Looking forward to crafting wonderful projects in 2014! Updated: Another poncho in beautiful Cerise.